Thank you to Shirley for introducing me to this super scrumptious snack + to the Secret Recipe Club for connecting me, yet again, with fantastic bloggers + amazing recipes! For all my previous Secret Recipe Club recipes, click here – there are TONS of awesome ones! Add the flour, sugar, salt and paprika to a medium bowl and whisk to combine. Cut the butter into small pieces and add it to the bowl. Then, using a pastry blender, mix the butter into the dry ingredients thoroughly. Combine the water and vanilla in a small measuring cup. Add to the butter/flour mixture and mix until a smooth dough forms. Add a bit more water if your dough seems too dry. Divide dough into 4 pieces. Work with one piece at a time, keeping the others covered with a towel so they don’t dry out. Lightly flour your work surface and rolling pin and roll the dough into a large rectangle, rolling the dough as thin as possible (1/16-inch thick at most). Use a pizza cutter or pastry wheel to cut the rectangle into squares about 1 – 1 .5 inches wide. Transfer the dough squares to the prepared baking sheets. You don’t need to leave much space in between the crackers. Sprinkle the squares lightly with salt. Repeat the rolling and cutting process with the remaining 3 pieces of dough. Bake the crackers, one sheet at a time, until crisp and lightly browned, about 5-10 minutes. The crackers can burn quickly so you want to keep a close eye on them. Once lightly browned and crisp, transfer to a plate to cool. Store the crackers in an airtight container. Secret recipe club?? Sounds like so much fun! Love that you made wheat thins at home.. I used to eat these all the time and haven’t had them in a while. Wheat Thins are my secret addiction. (Well, not so secret anymore!). Your version looks fantastic, and I like the fancy edges, too. Nicely done for SRC! I made wheat thins once and they were so good. Love that you used a sawtooth cutter. I love making homemade crackers and these look yummy. I’m surprised by the addition of vanilla but am intrigued. I must try making these ASAP. Nice choice for SRC! Renee, i was surprised by the addition of vanilla, too, but I just went with it! Since whole wheat flour can be quite ‘earthy,’ I think that tiny bit of sweetness helps cut through it. Loved your choice for Reveal Day, hope you are enjoying the day! I love wheat thins but unfortunately I made the mistake of reading the ingredients and learning that they are not as healthy as I thought. This sounds like a perfect fix for my wheat thin craving. I like the crinkled edges, too! 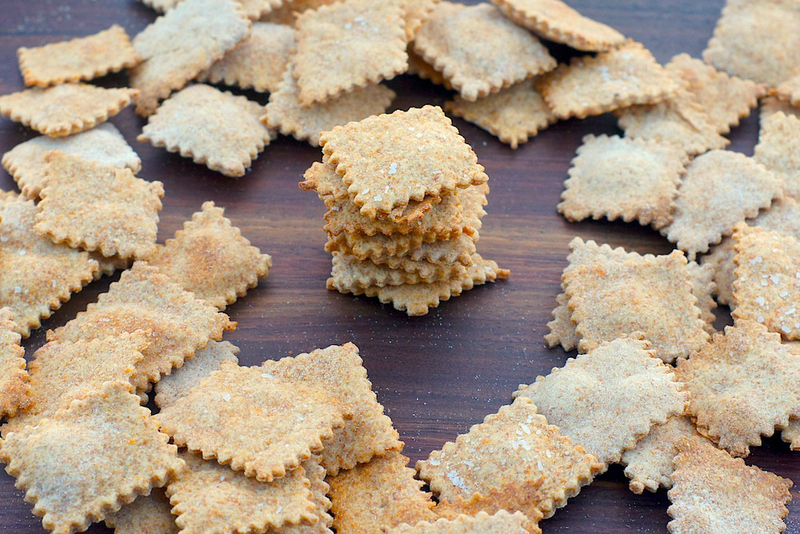 I’m such a fan of wheat thins and I haven’t attempted homemade crackers yet. Gotta make these! They were a naptime project for me, too, Natalie! =) Hope you try ’em soon and love ’em as much as we did! I love the idea of homemade snacks like this – what a great pick this month! Wheat thins are so addictive and I love to munch and snack on them with some hummus or a dip. What a great snack recipe! I love the crinkled edges too. Huh, that recipe looks easier than I thought it would. I might try that after all! My husband goes through so many boxes of wheat thins! I’m going to have to give these a try! I always enjoy your Secret Recipe Club posts, but this one rocks my world. I adore Wheat Thins! Thanks! these look so good amy! great src recipe i need to make homemade crackers more often. These look great! I made soda crackers for the first time last month. Need to give these a try too! I LOVE making my own wheat thins! I add olive oil and rosemary for a little flavor twist– so yummy! I love the pretty edges on yours! Oooh, love your idea of adding rosemary! Fabulous SRC pick! Not only do your crackers look yummy but completely adorable too! I had your blog as my SRC assignment this month. I loved every moment that I have spent at your blog. Unfortunately, between having a terrible head cold and commitments that were unexpected today I have been quite late in posting my blog post. FINALLY it’s up! I am so sorry about my tardiness. I apologize profusely!! Don’t you worry one bit about it! I hope you’re feeling lots better + got all your commitments taken care of. Cheers! Oh my gosh those are so cute!! I definitely need to make these!!! Awesome photo too. Yesssss, one of my FAVORITE snack foods! You are amazing! Yum. I’ve tried making homemade crackers and they are so good! Super! Well done! I can see that its a hit! Mmmmm I’m a sucker for wheat thins! I’ll have to give these a try when Oliver is a little older! Oooohhh I used to LOVE wheat thins, but I haven’t had them in years. I love this homemade version – they look delicious! I’ve never thought of making my own wheat thins! This is a great idea! And your crinkled edges are too cute! oh these look so fun! I’ve been toying with the idea of making some more homemade snacks (outside of my current dip phase), and these don’t look too difficult! I’m not sure I’d be able to resist creating different flavors with fun seasonings (similar to what the Wheat Thins brand does today). I could see a sriracha flavor being interesting…or pesto…or (dare I say it) truffle??? The possibilities are endless! Ooh, love the idea of playing around with different flavors! Pesto or sundried tomato would be faaaaabulous. YUM! 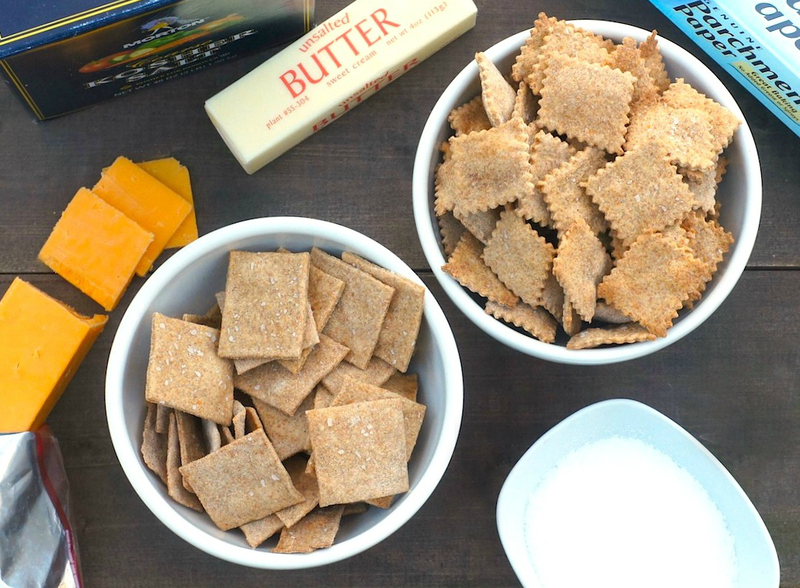 I’ve had homemade wheat thins on my to-do list for quite awhile – thanks for the reminder! Yours turned out perfectly! I’ve always wanted to try homemade crackers, and these look super easy, Amy! I love that they’re all whole wheat, too. So delish and perfect for dipping! Oh, so tasty looking! I love making my own crackers and this recipe looks like it will have the taste we like so well – thanks! I love that you made wheat-thins! What a great SRC pick this month!! What a great way to make one of my favorite snacks even better. I always hate reading the back of a wheat thin box. So many ingredients that I’m not happy about! I’m eager to make my own! This is such a awesome idea because goodness I can eat a whole lot of wheat thins.